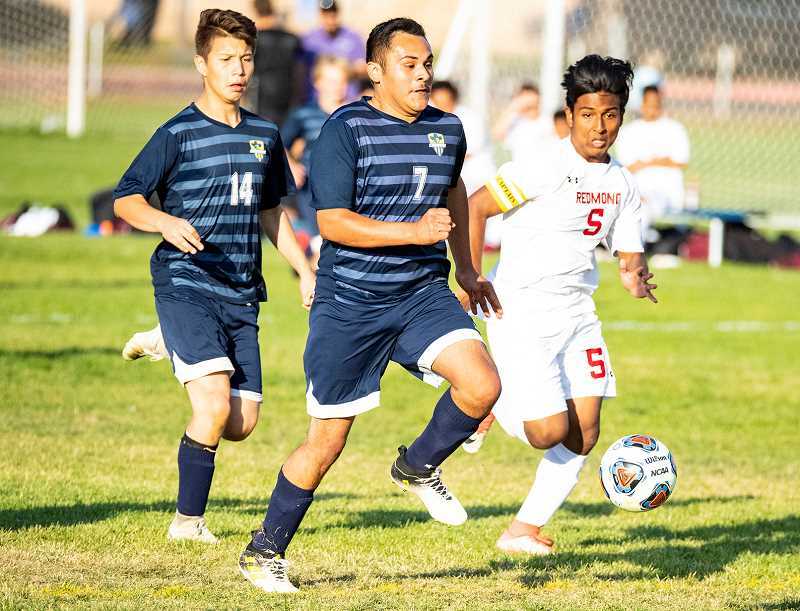 Wins have been tough to come by this year for both Redmond and Crook County in Intermountain Conference boys soccer. The two teams entered Thursday's season-ending match at Redmond in fifth and sixth place, respectively, in the IMC standings with just one win apiece. "It was an important game for us and for them too," said Crook County midfielder Elias Villagomez. "We were at the very bottom of the ranks, and it was a big deal to win that last game." The Cowboys did just enough to escape with a road victory, scoring an early goal, then holding off several Panther scoring opportunities to take a 1-0 victory. The win vaulted Crook County to fourth place in the final IMC standings, while Redmond fell to sixth and last place. Pendleton finished in fifth. The Crook County goal came midway through the first half as Redmond's goalkeeper took a drop kick, which was taken by Crook County's Abel Nunez, who delivered a perfect pass to a streaking Kevin Arroyo, who raced behind the Panther defense and knocked the ball into the back of the net. "It was really fun because it was our last league game of the year, and we got to win it," Villagomez said. "We tried our hardest and nobody gave up on each other. I thought we played like a team and everybody respected each other." The Cowboys had several other good scoring opportunities but struggled with off sides calls throughout the match and were unable to score again. Meanwhile, the Crook County defense played their best game of the season, putting up a defensive wall that the Panthers were unable to crack. Crook County goalkeeper Pablo Casado made seven critical stops on the night, while defenders Moses Freauff, Mitchell Bennett and Brogyn Miller-Sampson kept the Panthers off stride throughout the match. "Pablo stopped seven really good shots, and they had a couple of free kicks, and he stopped them all," Villagomez said. "I appreciated him and everything he did." With the victory, Crook County closed out their season with a 2-10-1 overall record and a 2-7-1 league mark, while Redmond fell to 3-8-1 overall and 1-8-1 in conference play with the loss. Ridgeview won the conference championship with a 10-2-2 overall record and an 8-0-2 conference mark and will host a match against Eagle Point beginning at 5 p.m. tonight. Hood River Valley and The Dalles/Dufur also earned playoff games, with Hood River Valley playing at Churchill and The Dalles/Dufur on the road at Corvallis. Both games are also today. "I'm really happy with how the season ended with a win, and I'm really proud of my team," Villagomez said. "Thanks to the coaches and everybody."